No matter how much I learn about Japanese food and culture, there is more, much more that I keep learning. Nowhere more is this exemplified than at the latest Japanese restaurant to open in San Francisco, Hashiri. I knew that the changing of the seasons is very important and celebrated in Japan, but it was only at the restaurant that learned that every season has three ingredient phases. 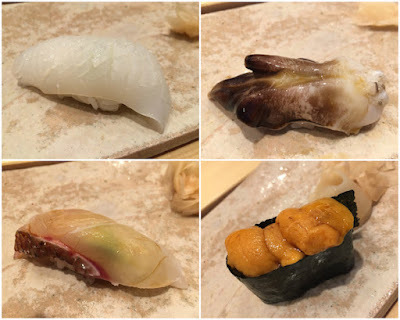 Hashiri is the word for first of the season, shun is the peak of season, and nagori is the end of the season. Not surprisingly this restaurant will change their menu with the seasons. In Japan not just the ingredients, but even the tableware changes with the seasons. The porcelain dishes at Hashiri come from Kyoto, known for ceramics. Hashiri, which just opened in what was Chez Papa Resto in Mint Plaza is a very unique restaurant for several reasons. Hashiri serves just one menu that is a kaiseki meal (a seasonal tasting menu of small dishes) with nigiri sushi ($250 per person in the main dining room and $300 at the chef's counter). 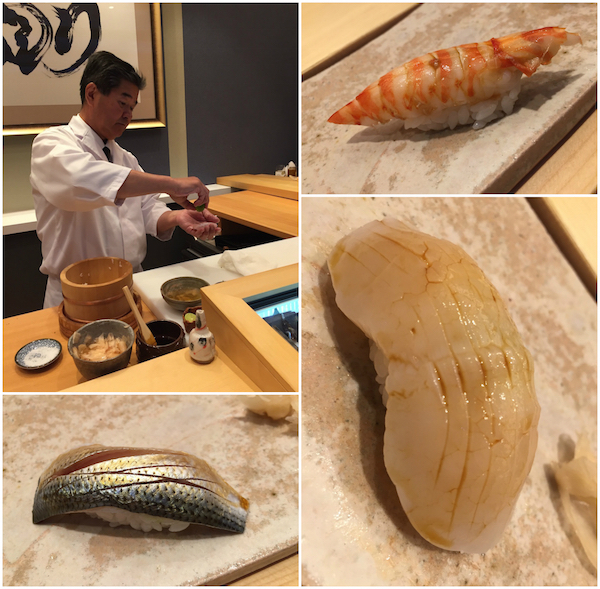 Very few restaurants in the Bay Area have kaiseki chefs and can prepare this exquisite cuisine. Kaoru Hayashi, Ryuichi Terayama, and Yasuyuki Rokuyata own the original Hashiri, a sushi restaurant in Tokyo. It is also perhaps the only high end Japanese restaurant with all Japanese chefs in San Francisco. Executive chef Takashi Saito was the opening chef at Izakaya Yuzuki, the sushi master is chef Tokunori Mekaru who comes directly from Hashiri Tokyo and the kaiseki chef Shinichi Aoki was formerly at Kaygetsu. The interior will make you feel as if you have been transported instantly to Japan. It’s sleek and modern but also very Japanese. There is contemporary artwork on the walls and the ceiling has 16 HD projectors with seasonal images floating above you. Right now it’s spring, so cherry blossoms shimmer on the ceiling. In addition to a fine selection of sake and wine, they also have Suntory Premium Malt's beer on draft. This is really a treat, very fresh and flavorful and not easy to find locally. But what you really want to know about is the food, right? The meal began with Akaza ebi with snap pea surinagashi and white sturgeon caviar. Surinagashi is a Japanese style creamy vegetable puree. In this case made from fresh peas but it could be from any other vegetable and broth or dashi. The refinement of this dish really set the tone of the meal. Taira gai or pen shell clam and local spring green salad with fresh bamboo, fiddlehead ferms and wasabi dashi. On top was a sprinkling of karasumi, or grated mullet roe. This dish was a bit like a spring still life, vibrant and beautiful. Amadai kuzu tataki, sesame tofu. Note the fresh herbal sansho leaves. The sesame tofu unbelievably delicate and soft. A very traditional dish, it eases you further into the meal. Aburi kinme dai, ponzu gelee. This was golden eye snapper with kabocha and watermelon radish. The exceptional knife work was evident in the finely slivered vegetables that almost seemed grated and the rainbow of colors hinted at the blossoming of spring. Morel mushroom, satsuki chawan mushi. The mushrooms were from Yosemite along with a bit of delicate Japanese seaweed. This was the softest chawan mushi custard I have ever had. A very luxurious dish! Kagoshima wagyu kuwa-yaki, simmer spring dailon, celeraic puree, pickled wasabi stem. This was one of those bites of perfection, super tender and buttery wagyu and for me the pefect portion, just a couple of bites over a celery root puree and almost microscopic shiso blossoms. I don’t think I ever had pickled wasabi stems. They are sourcing their wasabi from Half Moon Bay. Junsai. This is an unusual kind of water lily buds, grown in fresh water lakes. It has an almost crunchy jelly like texture. The junsai was hiding underneath the vegetables on top. One piece prepared in front of you, each perfection! We had squid served in a modern style topped with crunchy salt, Japanese butterfish, horse mackeral, kohada or gizzard shad, King salmon, otoro or the fatty part of the tuna, scallop, uni from Hokkaido, and 4 things I had never had before Nodoguro or black throat from Wayakyama, baby spring red snapper, torigai or heart clam, imperial prawn. The sushi was truly outstanding, very balanced and luscious each with a distinct texture and flavor than ranged from mild to rich and unctious. Omelet and at Hashiri they brand it with a branding iron! It's not usually done in front of guests, but we wanted a demonstration. This signals the end of the meal in traditional Japanese restaurants, not the beginning. Kuzu mochi chimaki— a sweet kuzu mochi wrapped in bamboo leaves, It’s served for Children’s Day in Japan. It’s served with kuormitsu a kind of molasses, and kinako a soybean powder. Last but not least, this spoon. It’s specifically for ice cream and transmits the warmth from your hands to the tip which allows for easy scooping of even hard ice cream. I want a set! Disclamer: I was a guest invited to a pre-opening preview of the restaurant. I did pay for drinks and tips. I was not compensated monetarily for writing this or any other post.